Who are Boomers and How do we Differ from other Generations? What is the Baby Boomer definition? If you were born 1946 – 1964, you are a Baby Boomer. The term "Baby Boomers" emcompasses a huge nation of folks -- from very different ages and eras, and yet, we are all Boomers! I was born in 1955, right plunk in the middle! As World War II ended, the war veterans got married, had families, and started this huge Boomer generation! Generally, the baby boomer generation is recently retired or considering retirement... and yes, we are already there! 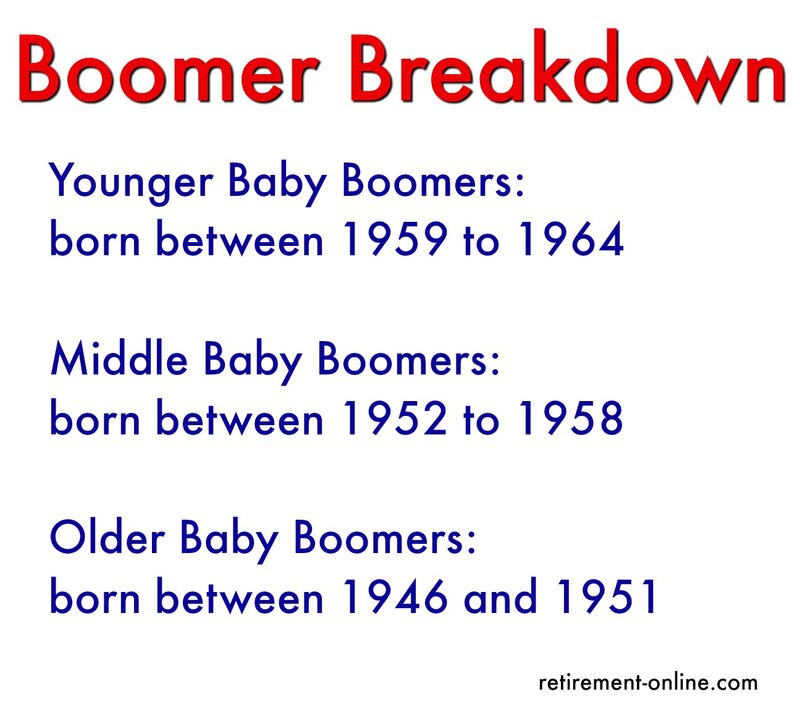 Learn about Baby Boomers with my quick video! Met Life breaks down boomers into three categories, and which makes sense personally, as all folks born over an 18-year period can't possibly all share the same Boomer views and characteristics. Right? The first boomers born in the 40s, are somewhat different from those born in the early 50s, more different from those in the later 50s, but very different from those born in the early 60s... Let's explore this a bit. Just reading some Boomer names towards the bottom of this pages proves how different Boomers can be -- from Captain Kangaroo to Captain Kirk! 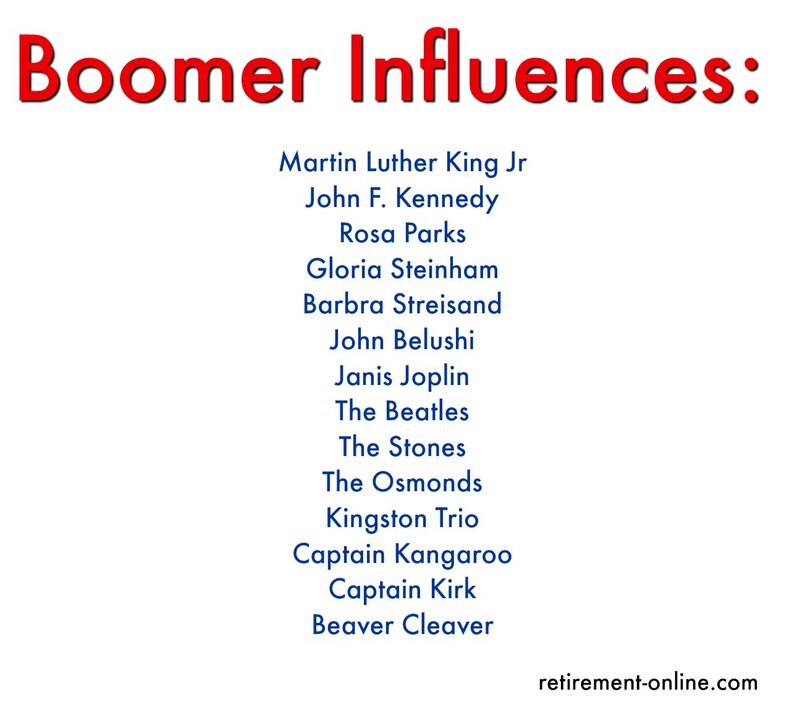 Click to read more about any of the boomer groups! Each page shows you exactly who they are, their music, tv shows, lifestyles and influnces. It's really interesting to see how varied Boomers are... and yes, we certainly have loads of differences in this Boomer Nation! Boomers control over 80% of financial assets and more than 50% of discretionary spending power in 2011. Met Life has been studying Boomers for some time now.Their studies are fascinating... In 2007, they published "Boomers: Ready to Launch" for Boomers who were turning 62 in 2008... the first ever Social Security eligible Boomers. In 2008, "Boomer Bookends" (love that title!) and that study compares the Oldest and Youngest Boomers (both ends of the boomers). In 2009, they studied the group in the middle, between the older boomers and the younger boomers. "Boomers in the Middle", published in 2010, focuses on those born 1952 - 1958. Me Again! It will be interesting to look at how Boomers see the world and retirement... only time will tell! We are living in a unique time when Boomer Retirement will be a huge part of society. Will there be senior housing projects everywhere, more assisted living, more senior government aid? Senior communities are being built like crazy in my home town, yours too? How will our society take care of all the seniors tomorrow? We pursued our dreams and tried to fix the world with our enthusiastic ideas. Just think, with 76 million boomers born and competing for the same jobs and opportunities in life, we are bound to be competitive. Boomers are often called the "Me Generation"
We were so lucky to be able to focus on ourselves more than previous generations. We learned, we challenged the status quo. The world has changed dramatically through boomer technology and more! Just look at those names... we went from the Leave it to Beaver family to John Belushi and the Stones. Unlike previous generations, we went from one extreme (the perfect family) to another (flower power at Woodstock and rock 'n roll)... and that is why Met Life invented categories of Boomers! Bell Bottoms, peace signs, mood rings, junk food, McDonalds... Oh, wait, I'm stirring up memories from MY teen years, not all boomer teens! Television was huge to Boomers - tv sets in homes increased from 4 million in 1952 to 50 million in 1960! We could SEE events unfolding on the tv screen, unlike our parents generation - Vietnam, Watergate, womens's rights, Kennedy being shot. Not sure if this is a good thing... keeps us almost too connected to today's realities.